From the very beginning, Rose City Park Presbyterian has had a commitment to stewardship and mission. Early on, the church sponsored missionaries in Thailand and Mexico and sponsored or assisted immigrant and refugee families from Germany, Hungary, Korea, Holland, Cambodia, and the Sudan. Members also helped plant Grace Presbyterian Church on NE Prescott Street and Roseway Presbyterian Church on NE 87th Avenue. A long time partner with local organizations, we were the location for over 40 years for the Meals on Wheels People’s Loaves & Fishes senior dining program in the Hollywood District, and have co-sponsored with the Hollywood Lions bi-annual Red Cross blood drives. For the past 20 years, Rose City has been active supporting Habitat for Humanity through builds, sponsorships and donations. Since 2015 we have participated in HOMEpdx’s outreach effots, bringing meals six times a year to people living in need downtown. Environmental Stewardship began with plastics recycling in 1990 before curb-side recycling became standard in the city, and continued with a battery recycling program, as well as donations to the Community Warehouse and the Climate Trust. In 2004 the church began a period of study on the issue of full inclusion into church life and membership of people who identify as LGBTQ. Through a process of education and conversation, the congregation has evolved into a welcoming congregation with membership in the Community of Welcoming Congregations and participation in the Covenant Network of Presbyterians. We welcome all people regardless of race, nationality, class, gender age, or sexual orientation and pledge ourselves to the reconciling work of God and Jesus Christ. 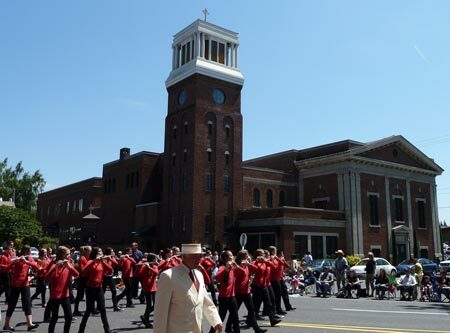 The church was the organizer of the first Rose City Park neighborhood children’s parade in June 1925, which ultimately developed into the Junior Rose Festival parade.